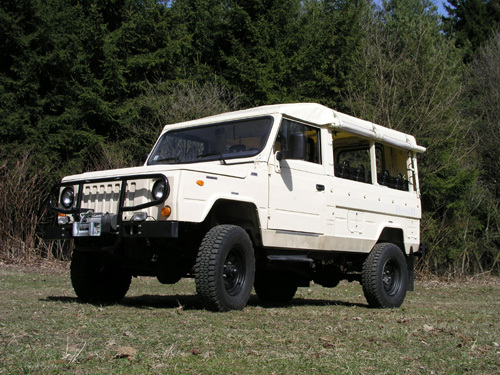 Mainly because Honker is not just unique utility vehicle, but also great car for free time activities, Soft-top version became almost as popular as Hard-top version. Instead of insulated fiberglass top, open top of the Honker is equipped with two layer canvas, with special heat shield with silencing effect. Thanks to this (and double heater system) you will be always comfortable in Honker, even in the winter. After removing the soft-top canvas, Honker will become 9 seats convertible, suitable for offroad sightseeing tours, or just to enjoy! If you remove rear seats, 9 seats convertible will become pickup truck, which will pass trough almost anything. Everything is included in single car. If you are interested about information of this special automobile, which became domain of drivers who want what they want, contact us and settle yourself a test drive!